Firefighters are working to suppress a wildland fire burning on the border of the Bitterroot and Salmon-Challis National Forests near the Reynolds Lake Trailhead, approximately 35 miles SW of Darby, MT. The fire is approximately 1,068 acres in size. 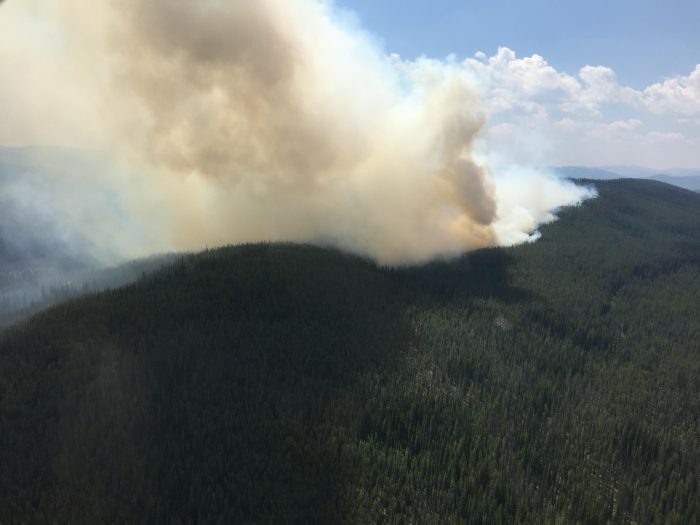 The fire was reported on Tuesday, July 17 after a lightning event moved across the southern end of the Bitterroot National Forest the night before. 80 personnel are assigned to this incident. There are no structures threatened at this time. Forest Road #044 to the Reynolds Lake Trailhead is currently closed. Please respect the airspace and do not fly drones in this area. Location 35 miles SW of Darby near the Reynolds Lake Trailhead. West Fork Ranger District. Fuels Involved Heavy timber. High elevation Sub-alpine fir and lodgepole pine with dead standing and down fuels, including mountain pine beetle mortality. Numerous hazards including falling trees. Significant Events Fire grew to over 1,000 acres yesterday pushed by strong westerly winds of up to 30mph. Most of the growth was on the east and south sides. Slowed down somewhat when it bumped into the Saddle Fire from 2011. West side is holding thanks to multiple retardant drops by large air tankers assisted by bucket work from helicopters. Three helicopters working on the fire yesterday dumped 63,160 gallons of water on the fire. Large air tankers also dropped 54,209 gallons of fire retardant helping establish a perimeter that crews on the grounds are now working to hold. Planned Actions Firefighters will continue contructing hand line today around the fire on the west and north sides anchoring off Forest Road #044 to keep it out of the head of Blue Joint and Deer Creek. Continue to utilize aircraft to moderate fire behavior and spread. This fire is being actively suppressed under a full suppression strategy. Projected Incident Activity Anticipating continued fire spread to the north and east. Active fire behavior with group torching and short crown runs and continued winds over the fire area. Remarks Fire is burning in remote location and rugged terrain. Firefighter safety remains a top priority. Numerous snags are in the area which presents a safety threat to firefighters in high wind situations. Weather Concerns Winds will continue today, but not as strong as yesterday. Humidity will again be low, in the low to mid teens. Hot and dry conditions expected over the next week with no relief in sight, highs in the mid-80s to low-90s.